What are the most popular online bachelor's degrees offered in Rhode Island? As a member of the New England Board of Higher Education (NEBHE), Rhode Island works in conjunction with the other five New England states to promote educational opportunities and services for the Northeast United States. Online learners benefit from the State Authorization Reciprocity Agreement (SARA), a collaborative program dedicated to reducing fees and increasing access to high-quality distance education programs. Another advantage for Rhode Island students is the Regional Student Program (RSP), which grants tuition discounts to residents who enroll in out-of-state public colleges and universities in the New England region. This program allows access to over 800 undergraduate and graduate degree programs, and saved students an approximate total of $58 million on tuition fees during the 2015-2016 academic year. Online colleges in Rhode Island offer students a host of benefits. Most online programs feature extremely flexible schedules, allowing students with jobs or other time commitments to complete their studies at a time and pace that works for them. Along with cost-saving measures introduced by the RSP, online students in Rhode Island often enjoy dramatically lower tuition fees when they attend a school in their home state. Students looking for in-person instruction can find programs that mix online instruction with in-person sessions, as well. Based in Kingston, the University of Rhode Island offers both on-campus and online options to students seeking to get an education. Online students at URI pay in-state tuition regardless of where they live. Resources available to distance learners include a writing center that offers online appointments, access to online tutors who provide one-on-one assistance, and technological support. URI offers one online program: a RN to BSN in nursing that requires students to complete 24 credit hours during courses that last seven weeks. UFI delivers online content asynchronously, and students can complete the program in as little as 15 months. Admission to the online RN to BSN in nursing program requires students to possess an RN license, a minimum 2.6 GPA, and either a nursing diploma or an associate degree in nursing from an ACEN-accredited program of nursing. Recognized as an innovative educational leader, Johnson & Wales University (JWU) is a private, nonprofit institution with four campuses in Rhode Island, Florida, Colorado, and North Carolina. The school has a student body of approximately 16,000 undergraduate, graduate, and online students. Degree programs are offered in various disciplines, including the arts and sciences, business, culinary arts, engineering, and design. One of the online colleges in Rhode Island, JWU's College of Online Education administers bachelor's degree programs 100% online in fields such as business, hotel and lodging management, entrepreneurship, and human resource management. One unique program, the BS in Baking and Pastry Arts and Food Service Management, is designed for students with an associate degree in the baking & pastry arts who would like to take the next step in their career. Six BSBA degree programs are offered in areas of specialization including international business and entrepreneurship. A leader in technical career education in New England, New England Institute of Technology is a private nonprofit institution with undergraduate and graduate degrees in more than 50 areas. The school is noteworthy because most of its bachelor's degrees can be completed in three years. New England Tech, one of the best online colleges in Rhode Island, has e-learning options that are designed for working professionals. Four online bachelor's degree programs are offered in Automotive Service Management, a program for working automotive and transportation professionals; Criminal Justice for Working Professionals, for public safety professionals; Rehabilitation Sciences, to train those working with the disabled; and the RN to BSN for licensed registered nurses. Some online degree programs have an accelerated format. Students have access to courses 24/7, in addition to online advising and tutoring. The school's tuition is the lowest of any private college in the state. Located in Rhode Island, Johnson & Wales University - Providence provides both on-campus learners and distance learners qualitative educational options. Services available for online students include a career resources center, resume consultation, interview preparation, access to library resources, and technical support that includes the option of chatting with IT professionals in real-time. Distance learners also receive assistance from a dedicated academic advisor who stays with them for the duration of their time at Johnson & Wales. The college offers two doctoral degree programs, more than a dozen graduate degrees, and around two dozen undergraduate options. Programs span fields like residential hospitality management and culinary arts, food service management, sustainable economic development, and human resource management. All of the degree-granting programs expose students to the best practices and best research in their fields. Tuition and fees at public, four-year Rhode Island colleges and universities have increased by 47.4% over the last five years, while state funding for postsecondary education costs decreased by 1.3% during this time. While spending cuts are relatively low compared to other states, the dramatic rise in tuition costs have made traditional college programs expensive. Accordingly, prospective students in Rhode Island are increasingly turning to online programs, where tuition and attendance costs are much lower. While Rhode Island is among the top 25 states in college attendance, reports in recent years indicate several challenges in encouraging diversity and promoting economic development through college programs. To support a well-rounded student body among Rhode Island's colleges and universities, the state has implemented a few college-completion initiatives. Through participation in programs such as the American Diploma Project and the PARCC Assessment Consortium, Rhode Island offers support to college-bound students who need financial or academic assistance to pursue their degree. These measures are particularly crucial for online students, who often don't have the means to attend school on campus. 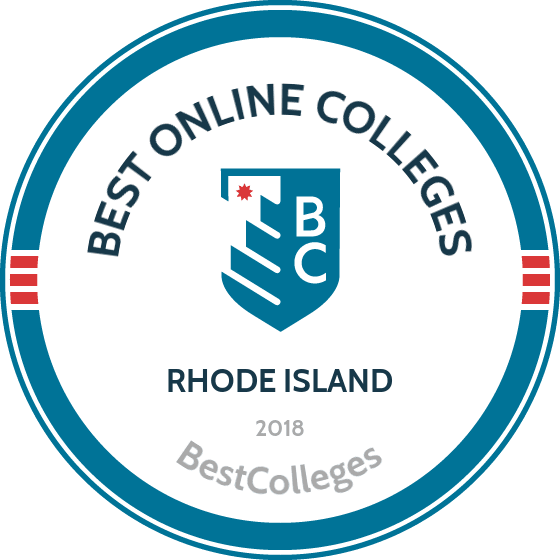 Browse our list of the best online colleges in Rhode Island for more insight into distance learning programs in this state. As of 2012, NCES reports indicate that 1.6% (1,347) of students in Rhode Island's Title IV enrolled in exclusively online programs. Increased tuition costs and a growing proportion of distance learners have encouraged schools across the nation to add online programs; Rhode Island's colleges are no exception. While the state's largest higher education institutions have offered online learning options for several years, other schools with smaller, private programs have recently followed suit. The Rhode Island Department of Education supports online learning at all levels through its virtual learning initiative, as well as through its membership in the Online Education Database (OEDb). Employment growth in this profession is moderate in Rhode Island. According to the Rhode Island Department of Labor and Training, long term projections show an increase of 10% in the total number of jobs between 2014 and 2024. Wages increased by 1% from 2011-2016. In 2016, what were the top careers in Rhode Island for people who had a degree in business administration and management? Data source: Rhode Island Department of Labor and Training, Bureau of Labor Statistics. Data may not be available for every year. Employment growth in this profession is moderate in Rhode Island. According to the Rhode Island Department of Labor and Training, long term projections show an increase of 10% in the total number of jobs between 2014 and 2024. Wages increased by 15% from 2011-2016. In 2016, what were the top careers in Rhode Island for people who had a degree in manufacturing engineering technology/technician? Currently, no schools in Rhode Island offer an online bachelor's degree program in engineering technology. Employment growth in this profession is moderate in Rhode Island. According to the Rhode Island Department of Labor and Training, long term projections show an increase of 15% in the total number of jobs between 2014 and 2024. Wages increased by 5% from 2011-2016. In 2016, what were the top careers in Rhode Island for people who had a degree in foodservice systems administration/management? Employment growth in this profession is moderate in Rhode Island. According to the Rhode Island Department of Labor and Training, long term projections show an increase of 0% in the total number of jobs between 2014 and 2024. Wages increased by 8% from 2011-2016. In 2016, what were the top careers in Rhode Island for people who had a degree in general studies? Employment growth in this profession is strong in Rhode Island. According to the Rhode Island Department of Labor and Training, long term projections show an increase of 74% in the total number of jobs between 2014 and 2024. Wages increased by 7% from 2011-2016. In 2016, what were the top careers in Rhode Island for people who had a degree in hospitality administration/management?